We then see an action scene in Mexico, during celebrations for Dia de los Muertos – the Day of the Dead. All “non-elite” people are dressed as skeletons and dancing in the streets. After the opening scene, we don’t really see regular people in the movie – just the British government and “Spectre” struggling for power. However, as the movie subtly lets us know, they are two sides of the same coin. If 007 represents the British government and the MI6, then “Spectre”, the shady organization looking to control the world, represents the occult elite. During that meeting, a German speaker outlines the “successes” of Spectre, which are perfectly in line with the real world elite’s “black” agenda. Not a lot of fiction going on there. One these “successes” is particularly creepy: The speaker talks about 160,000 migrated females who have been placed in the “leisure sector”. The “leisure sector” means prostitution. In subtle scenes like this one, the movie discloses the true, devastating agenda of the elite in this day and age. As I’ve mentioned in past articles, the migration crisis has been forced on the world for several reasons. One of the darkest reasons is to easily exploit millions of displaced people, who have minimal rights and few written records, in all kinds of nefarious human trafficking ventures. It has already started: News sources have reported that over 10,000 refugee children are already missing. How many of them will find themselves in the occult elite’s underground child abuse rings? “In three days, there’s a security conference in Tokyo to decide the New World Order”. “We’re going to bring British Intelligence out of the Dark Ages and into the light”. “Do not let them tell you we need less surveillance. We need more. Much more. I say again, the Nine Eyes committee would have full access to the combined intelligence streams of all member states. More data, more analysis, less likelihood of terrorist attacks”. 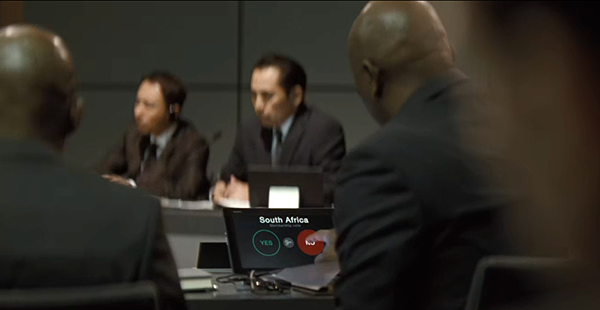 During that meeting, the participating countries are subjected to a vote to get worldwide surveillance going. We then see that South Africa votes “No” to the New World Order. ← Torture R U.S. Does Anyone Care? Der aktuelle Bond “Spectre” ist eine Beschreibung der aktuellen Zustände in den Regierungen und ihrer schattenhaften Hintermänner, die die NWO (New-World-Order, Neue-Welt-Ordnung) einführen wollen. In vielen anderen Bonds geht um den Start des 3. Weltkriegs, Kampf um Öl und Macht, Reduzierung/Ersetzung der Weltbevölkerung. Woher kennen wir das nur? Neu ist, daß die Bösewichte jetzt direkt in den höchsten Kreisen der britischen Regierung zu finden sind. – Wenn jetzt auch noch die Agenten durch Drohnen ersetzt werden, wohin soll das führen? – Wenn man den Abzug drückt, muß man sich sehr sicher sein. – Überwachungs-Microchips, die Bond direkt ins Blut gespritzt werden.